If the United States loses to Guatemala on Tuesday, the Americans almost certainly would fail to qualify for the 2018 World Cup. COLUMBUS, Ohio (AP) — If the United States loses to Guatemala on Tuesday, the Americans almost certainly would fail to qualify for the 2018 World Cup. "There's a sense of urgency tomorrow night because we need three points now," U.S. coach Jurgen Klinsmann said Monday. "We came back here in a must-win situation," U.S. forward Clint Dempsey said. Even with a tie, the U.S. would be in trouble — possibly needing No. 49 Trinidad to win its home game against Guatemala in September. The Americans' remaining matches are at St. Vincent on Sept. 2 and home against T&T four days later. 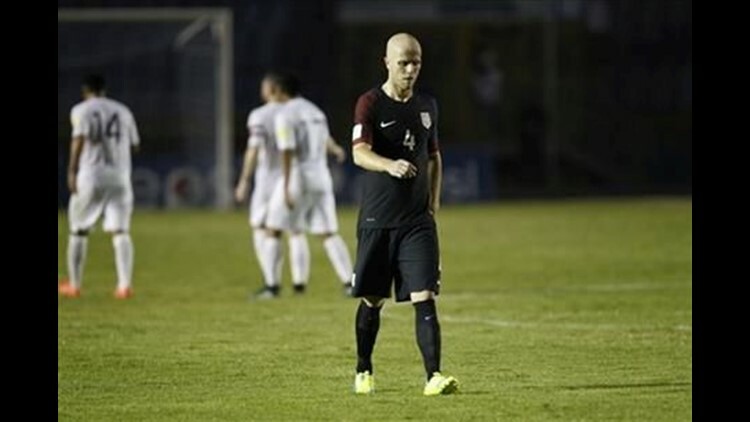 "All these experiences along the way you use to help you get through," U.S. captain Michael Bradley said. "You have to understand that somewhere along the way, maybe twice, you're playing in a game where your lives depend on it. Certainly that's the case tomorrow night." "I'm not playing anybody out of position," Klinsmann said. "I know that Geoff Cameron can play right back and center back. I know that Yedlin can play right winger and right back. This is a good thing for us to have because we try to put the pieces together the best way possible in order for them to fit. Having that option with certain players — Fabian Johnson as a fullback or as a midfielder, which he does the same thing in transitioning in either position with his club team — is good for us." "Certainly Columbus, when you look back at the history, there's something special here," Bradley said. "It's a bit of mystique. Teams come here and know a little bit about that history and look at our record when we played here and they know they're going to be in for a tough night." "We hope the fans, from time we step on the field for warm-ups, can give us a real boost in terms of energy, life, passion," Bradley said. "Make this a place from the time they get here, Guatemala knows they're not coming away with anything." "He's got experience, he's clever," Cameron said. "He looks for fouls. He kills the game off, slows it down, tries to dictate it to their pace."